Bob Marley’s sound is a timeless marvel. His hypnotic voice accompanied by rhythmic melodies and soothing harmonies is somehow hard-hitting and relaxing at the same time. Not only is his music soulful and pleasing to the ear, but it is also valuable. His lyrics are simple but refined to unwavering perfection. Hearing his steely voice enunciate, “don’t worry, about a thing,” fills the listener with a sense of unquestionable yet irrational ease – you are consumed by his celestial voice. For the length of a song, everything unpleasant disappears and you are left alone with good vibrations and content. Everyone has something to turn to when they feel like nothing is going right; for many, it is the music of a calming legend. Bob Marley and the Wailers released 13 studio albums, 5 live albums, 38 compilation albums, 133 singles, and 11 box sets. Their talents blended to create tear-jerking, heart-rendering, and soul-stirring music. 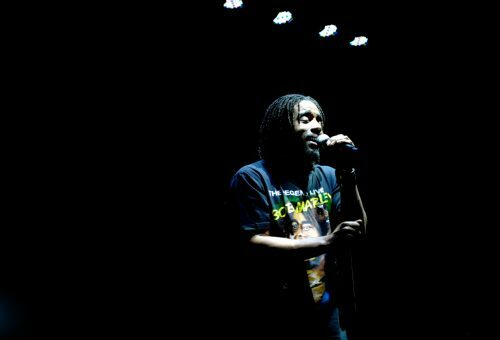 Thirty years after Marley’s death, The Wailers performed live during the 2010 International Art and Culture Festival in the ancient theatre Salamis. This ancient Greek city-state, containing the works of Leonardo da Vinci, is home to the fictional Othello’s real tower. Namık Kemal, an Ottoman author and poet who is often referred to as the Turkish Shakespeare, was exiled at Salamis for 38 months. The theater can seat roughly 15,000 and is a place charged with emotion, inspiration, and sentimental history. It was there that I realized how important Bob Marley and his message really are. His music and his legacy will unquestionably live forever. Marley constantly worked to promote peace and cultural appreciation within Jamaica. He has defined Jamaican music and is regarded as a prophet and figurehead for the Rastafarian religion. He was, and still is, known as the first Third World superstar. The history of Jamaica is a tragic one. The native Arawak people were all killed by English settlers. In 1713, the Treaty of Utrecht made Jamaica the official distribution center for slaves to the New World, which Marley touches upon in several songs, including ‘Redemption Song’. In 1907 an earthquake destroyed most of Kingston, the capital and largest city of Jamaica. Just as the economy began to recover in the 1930s, worldwide depression set the island back once again (Salewicz, 2010). When Marley was born in 1945, Jamaicans were at the beginning of their fight for independence. Marley’s desire to remedy Jamaica after its negative past was clear throughout his career, but he also wanted his message to reach everybody. His dedication to creating a world of equality and peace is unparalleled. His activism was not reserved for personal gain or the success of Jamaica; he genuinely fought to create unity and happiness throughout the world. Moreover, Marley’s simple, clear view of life and “mixed-race archetype” allowed listeners to project their own perceptions and feelings on to him (Salewicz, 2010). His lyrics depicted oppression and corruption but were countered by an honest belief in peace and in an end to injustice. His reluctance to submit to the allure of money and fame displayed his untainted intentions: spreading unity, peace, and happiness through music. His image, always including a spliff, is one of peaceful rebellion. Rising from the slums of Jamaica, Bob Marley has shown the world that giving life meaning isn’t so difficult after all. Nevertheless, Marley’s rise to success was not an easy one. At a young age he was left alone. He didn’t know who his father was. His mother moved to America. Until the age of 12 he was raised by his aunt, who made him wake up at five every morning to do field work (Salewicz, 2010). Afterwards, he slept on the floor in a recording studio in Kingston. At the age of 21, Marley left his wife Rita and moved to Delaware to live with his mother but quickly became depressed as his Rastafarian views and love of music were suppressed. Marley learned what it was like to be troubled. By coming to terms with these negative feelings, he found ways to combat them. His music encourages the listener to forget about the things that worry them, because, somehow, it will all work out. And for him, it did. Eight months later, Marley returned to Jamaica. Although he was able to pursue his career in music, the social and political environment of Jamaica was anything but desirable. Decolonization, resulting from the end of the Second World War, allowed Jamaica to make the transition to an independent state. Two political parties were formed, and power was juggled between the two. There was no sense of true Jamaican nationalism or unity. As Marley grew up, he struggled to understand his identity. His country was not really its own country. His father was white – his mother black. His biracial background gave him an open-minded understanding of race, “Until the philosophy which holds one race superior and another inferior is finally and permanently discredited and abandoned, everywhere is war.” With no definitive identity, Marley grew to realize that we do not have to be divided according to race or nationality; we are all citizens of the world. At the age of seventeen, Marley witnessed the creation of an independent Jamaica, but the island remained unchanged. Arguably, things got worse as people began to struggle to attain positions in government. Members of parliament for each of the ghetto constituencies of Kingston were surrounded by violent sycophants and political patronage became the ruling principle (Salewicz, 2010). Marley believed that nothing was achieved through politics. He expressed his annoyance with the government of Jamaica and its red tape politics, “How many rivers do we have to cross before we can talk to the boss?” and constantly referenced politics as “politricks,” (Bordowitz, 2004). The ‘Rude Boy movement’ had also emerged in Jamaica during Marley’s teenage years. Rude boy youth were known for listening to ska, rocksteady, and jazz music: the underpinnings of reggae. However, they were also associated with violence and bloody gang fights. Marley embraced its musical elements but rejected this violent image. In the song “Rude Boy,” Marley calls for peaceful youth revolution and an emphasis on music and the soul. The violence he was surrounded by as a young adult influenced his life as a peace-activist (McCann, 1994). Marley’s humble upbringing in Jamaica shaped his image and ideology as a prominent musician in years to come, but it also helped him get through the early stages of the struggle to make music into a career. His first record was released when he was 17 – ‘Judge Not.’ His name was misspelled as “Bob Morley” on the label. He spent most of his little pay on a jukebox up the street from his workplace where his song could be selected. He played his record so often that the owner removed the record from the jukebox and told Marley to leave and never come back. Today, Bob Marley can be seen as the personification of unity, marijuana smoking, peace, acceptance, rebellion, and happiness. He is relatable but also a “natural mystic,” rising from the beautiful yet mysterious island of Jamaica. His appeal stems from his ability to accurately depict ghetto life, oppression, and corruption. But Marley can also uplift and empower even the most sorrowful spirit with soothing words, and an unfaltering reassurance of impending happiness. Bob Marley’s image is eternal – his message continues to spread through his music, influencing today’s world and allowing him to live forever. Bordowitz, Hank. Every Little Thing Gonna Be Alright: The Bob Marley Reader. Cambridge, MA: Da Capo, 2004. Print. Marley, Bob, and Ian McCann. Bob Marley: In His Own Words. London: Omnibus, 1993. Print. McCann, Ian. The Complete Guide to the Music of Bob Marley. London: Omnibus, 1994. Print. Salewicz, Chris. Bob Marley: The Untold Story. New York: Faber and Faber, 2010. Print.